The Wing rotated pilots and personnel from each of the fighter squadrons. Deployed as Cube 51-56 and returned home as Cube 71-76. Deployed to cover for 31 FW who were deployed away (Red Flag?). Arrived as Mazda 51-54, 61-64 and departed as Trend 41-44, 51-54. Diverted to RAF Luechars 26 February as Trend 41-46, 51-54. Had arrived by 15 April as they were noted at RAF Leuchars this day. 176 FS/466 FS aircraft unidentified. Deployment staged via Moron AB, Spain. First time that reserve and guard personnel and equipment teamed up in support of ONW. Crewed by 176 FS (April-May), 162 FS (May-June) & 466 FS (June - July). 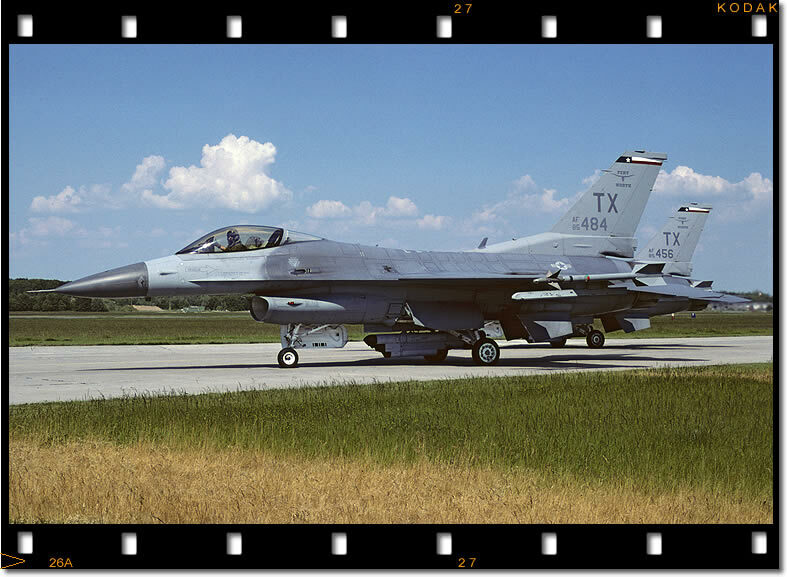 419 FW History has this to say: " The 419th Fighter Wing (June 2 - July 2) and the 482nd Fighter Wing (July 2 – Aug. 2) flew 670 sorties and 1,605 hours while deployed to Incirlik Air Base, Turkey, in support of Operation Northern Watch. 419th pilots had logged more than 203 missions over the skies of Iraq "
 See seperate deployment later in year for info concerning this. Arrived RAF Lakenheath 7 April as Trend 11-14, 21-23. Departed as Trend 11-16 10 April to Incirlik replacing 493 FS/USAFE (see also note). Departed via Moron AB, Spain. 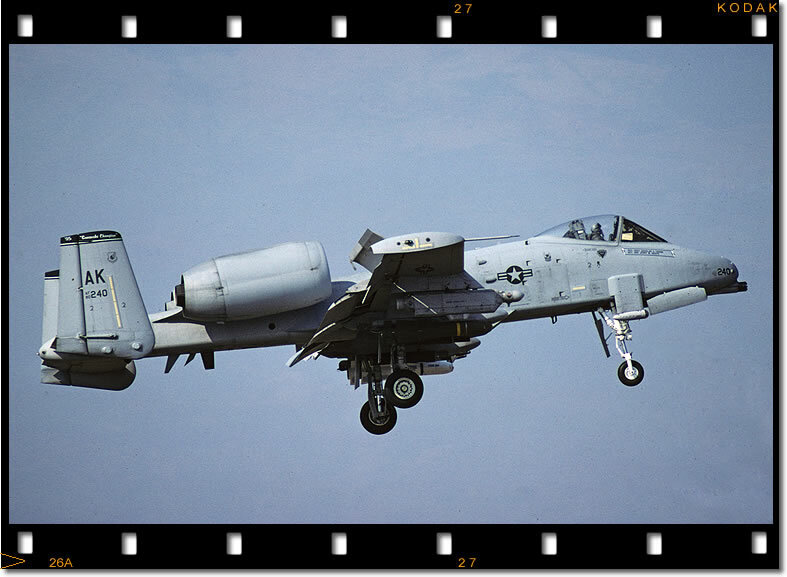 Air spare and returned to Lakenheath. Departed to Incirlik 9 May to replace 76-0107  Returned to Lakenheath on 6 May and departed as Jump 11 to Moron 23 May. 2 F-16s remain unknown. Deployment was last noted 2 May. Staged via Lajes. Replaced 52 FW/USAFE at Incirlik. Displayed only at Mildenhall for annual Air Fete. Re-numbered to 5 for display. Deployed a number of a/c to Laage for DACT with MIG29/F-4F. 301 FW documents have this to say concerning the deployment: " The mission objectives for the fighter unit include joint maritime operations in the Baltic Sea, interdiction missions with Maverick air-to-surface missiles, and defensive counter air missions. The deployment is designed to enhance combat capabilities with realistic combat training and expose Air Force Reserve Command pilots to the capabilities of the MiG-29 Fulcrum. 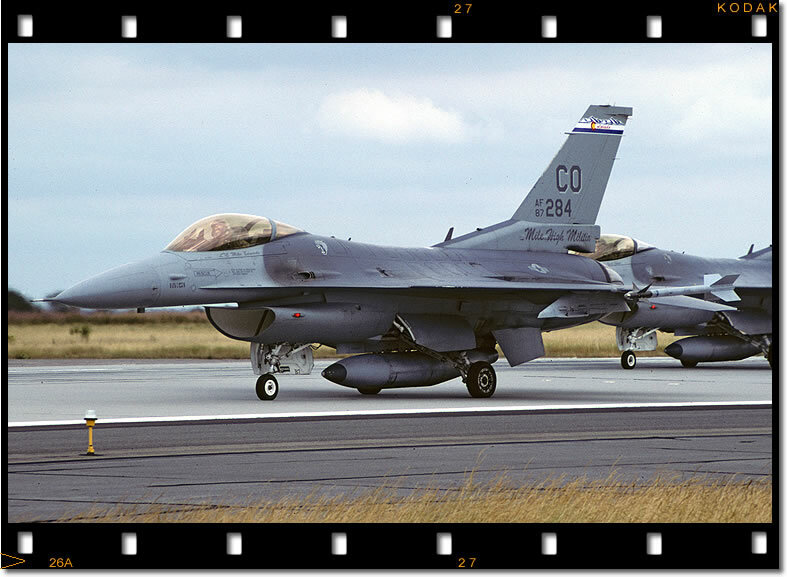 A total of 200 reservists from the 301st Fighter Wing took their F-16s and 95 tons of support equipment to Karup, Denmark, for exercise Central Enterprise. The deployment from the Fort Worth Joint Reserve Base began 24 May 1997 and lasted five weeks. The fighter wing deployed with the 927th and 940th Air Refueling wings from Selfridge Air National Guard Base, Mich., and McClellan Air Force Base, Calif. An E-3B airborne warning and control system aircraft from Tinker Air Force Base, Okla., flown by an AWACS crew from the Reserve’s 513th Air Control Group operated out of Geilenkirchen, Germany, to support the exercise. The exercise tested unified maritime operations in the Baltic Sea, interdiction missions with Maverick air-to-surface missiles and defensive counter air missions. The deployment was designed to heighten combat capabilities with realistic combat training and expose Air Force Reserve Command pilots to the capabilities of the MiG-29 Fulcrum. KC-135s from the 927th Air Refueling Wing and the 940th Air Refueling Wing flew 56 sorties and 188.4 hours. F-16s from the 301st Fighter Wing flew 220 sorties and 369.7 hours. An E-3B, manned by personnel assigned to the 513th Air Control Group, unit flew 13 sorties and 93.50 hours while operating from bases in central Europe. " Stayed at Lakenheath. Marked 4 FW. Departed as Slip 15 on 14 June bound for Moron AB to join a 4 FW 'Operation Southern Watch' deployment which was returning home. Departed to CONUS (possibly via Moron?) as Slip 11-13 15 June  Slip 14 diverted to RAF Mildenhall on return from Mirogod. It was joined by 4 FW F-15E 88-1668(yl) (from the OSW deployment mentioned above at Moron). Both these departed home about a week later. Whilst deployed for Alert duties (First time F-16s had been assigned) they also particpated in Exercise Northern Viking. No aircraft or arrival date identified (probably early July). Crewed by Alabama Guard for first 30 days then New York. Staged via Moron AB as Trend 31-36, 41-46, departed to CONUS 4 October. No aircraft identified. Replaced 419 FW deployment. AFRC documents state: " Another Reserve F-16 unit, the 482nd FW will send 12 Block 32 aircraft to Incirlik in July for a month to support Northern Watch. The reservists will be replaced by a Guard F-16 unit flying Block 30s, says Byrd. "In future deployments where we are responsible for two- or three-month rotations during contingency operations, we will pair the 419th with the 301st (FW from Naval Air Station Fort Worth Joint Reserve Base, Texas) and the 482nd FW with the 944th (FW from Luke AFB, Ariz.)," said Byrd. "They fly the same block F-16s, so they can share the same aircraft. The savings in flying hours and fuel make these deployments more cost-effective." No aircraft or dates identified. Cube 21-23 Departed 7 September . The two noted diverted to Lakenheath and departed home 9 September The third F-16 remains unidentified. Wing Commanders aircraft. Marked with large 'Cougars head' and 140 WG titles. Staged via RAF Lakenheath 6 September/17 September as Cube 71-76. Departed home 19 September as Mazda 71-76. During the exercise in Poland they combined with 52 FW F-16Cs, 126 ARW KC-135s and 182 AW C-130s to form the 52nd Combined Airpower Expeditionary Wing. No further info. Only mentioned in unit history.